Mothering, as author Joan Wolfe well knows, is one of the most polarizing topics of our time. And yet we all seem to agree that, when it comes to feeding babies, breast is best. At least, until now. 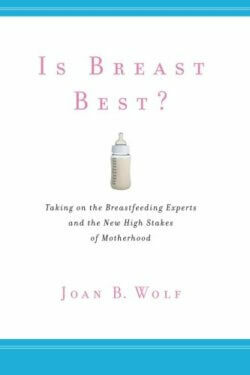 In your book you argue with the scientific evidence that breastfeeding provides a host of health benefits for both the baby and the mother. Is the research wrong? We give women lots of unequivocal information about the merits of breastfeeding, and women take it very seriously. When you tell somebody that if you breastfeed, your child will be more intelligent and sick less often, will have fewer heart attacks and will not get leukemia, that's pretty serious advice. But the truth is that the science grounding that advice is much more problematic than we are led to believe. Lots of women are making a decision about how to feed their baby based on incorrect information. Breastfeeding is promoted as something that protects against Leukemia, ear infections and obesity, and protects mothers against breast cancer and ovarian cancer. These are outrageous claims. Breastfeeding does reduce gastro-intestinal. But it’s one thing to say your baby might get one fewer diarrheal infection this year and it’s another thing to say your baby might get leukemia if you don't breastfeed - and the Surgeon General has said this. (The Surgeon General’s Call to Action to Support Breastfeeding, January 20, 2011). What have you seen in the data that leads you to believe these claims are false? Breast fed babies do tend to have fewer ear infections, do grow less obese and by the measures we've come up with, are more closely bonded with their mothers. It’s hard to argue that there's no association between these results and breastfeeding. But it’s not clear that breastfeeding actually causes these results. If you are a mother who chooses to breastfeed, it’s likely that you’ve chosen to breastfeed because you believe it’s healthier for your baby. Research says that even low-income women are choosing to breastfeed not because it saves money, but because they want what's best for the baby. My contention is that mothers who make this choice make a whole series of other choices, too, throughout their babies’ and children's lives, that have health benefits for the children. It’s entirely possible that a mother who breastfeeds also encourages healthy eating, exercise etc. So if there is an association between having been breastfed and being less obese, it’s not at all clear that the association is because of the breastfeeding. It’s the same thing with IQ. There’s a connection between breastfeeding and higher IQ, but maybe it’s the result of the environment that a mother who has chosen to breastfeed creates for her baby; if you engage your baby and read to your baby, you’re going to raise a smarter baby. So there are benefits that appear to come from breastfeeding that could just as easily come from behavior surrounding breastfeeding – behaviors that anyone, formula feeders included, could adopt. What about the emotional bond? We don't have any compelling evidence that breastfeeding causes children to be emotionally healthier. It’s anecdotal. The assumption is that there's something in the breast milk or the breastfeeding process that establishes emotional health. This hasn’t been demonstrated. It’s entirely plausible that it’s something else resulting in emotional health - that it’s the behavior surrounding breastfeeding. You’ve said you’re interested in how breastfeeding gets in the way of leveling the playing field between men and women and how it gets in the way simply because we assume that it’s best. But what’s the downside? The truth is that in terms of the decision to breastfeed, it’s not all gains. There are costs to breastfeeding - the costs are a mother’s time, the mothers own emotional and physical health, the long term economic consequences that come from not working or choosing to have a more marginal job so that you can breastfeed. None of these costs get talked about. What we hear is that breastfeeding is free. And from a woman’s perspective, I think that this is offensive. If men had functioning mammary glands, my sense is that we’d get a very different discourse about breastfeeding. We would have a sense of how small the benefits probably are and we would say that formula feeding is fine. Why would the medical establishment – and many parents themselves – overstate the case for breast feeding? We are a risk-obsessed society. We are consumed with the idea that we should be preventing any risks that we can identify, and we are particularly focused on health risks. We’re also a society that believes that mothers have a certain responsibility to do anything for their children. Mothers are responsible for eliminating any risk to their baby, no matter how small, unlikely or poorly understood; no matter what the cost is to the mother. We care about the children but we define what is best for the children often according to what mothers can do to alleviate risk. But on the other hand we’re willing to allow our children to be in risky situations, when to eliminate that risk would require sacrifice from fathers or communities or governments. In the book, I talk about “total motherhood,” which is the idea that we expect mothers to essentially disappear - when it comes to taking care of their children - as individual autonomous beings. All of their needs, wants, and desires are subjugated to their baby or children.